2+2 Dialogue = Withering Away of India’s ‘Strategic Autonomy’? The outcome of the 2+2 Dialogue between the Foreign and Defence Ministers of India and the United States held in New Delhi is on expected lines. It is clear from the statements issued by the leaders of the two countries— jointly and in different contexts—that India has been incorporated into the US strategic games in the Indo-Pacific region with attendant implications for New Delhi’s national sovereignty and foreign policy autonomy. As such Prime Minister Modi’s commitment to ‘strategic autonomy’—as he referred to at the Shangri La Dialogue in Singapore (India, Ministry of External Affairs 2018a)—has turned out to be a ‘strategic’ liability in the emerging scenario. The signing of the Communications Compatibility and Security Agreement (COMCASA) is a clear signal that the two countries have moved to the next stage of strategic partnership. 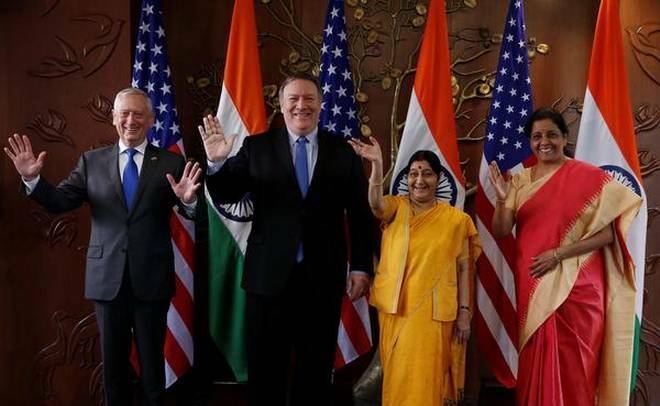 It may be noted that the US Secretary of State Michael R. Pompeo had already acknowledged, on the eve of the dialogue, that India is a “true strategic partner” who “is our only major defense partner,” and “the only designated major defense partner, with whom we have a great relationship and who is very important to our success in our Indo-Pacific strategy – enormous country with incredibly opportunity and capacity for wealth creation.” Pompeo said that “India and the United States have a natural starting point for advancing a free and open Indo-Pacific” (US, Department of State 2018a). Secretary of Defense James N. Mattis told reporters in the US that his visit to India “is a firm indicator of what we see as India’s place among our most strategic, and I would even call them ‘consequential,’ emerging partners” (US, Department of Defence 2018). He also recognized “the increasing connectivity between the Indian and Pacific Oceans, renaming U.S. Pacific Command to the U.S. Indo-Pacific Command.” Mattis said that “with India as a major defense partner, we are elevating our defense relationship to be on a par with our closest allies as we deepen the broader U.S.-India relationship, enhancing our interoperability, our defense trade, our technology innovation and industrial collaboration, and bolstering our people-to-people bonds (US, Department of State 2018b). reaffirmed the strategic importance of India’s designation as a Major Defense Partner (MDP) of the United States and committed to expand the scope of India’s MDP status and take mutually agreed upon steps to strengthen defense ties further and promote better defense and security coordination and cooperation. They noted the rapid growth in bilateral defense trade and the qualitative improvement in levels of technology and equipment offered by the United States to India in recent years. They welcomed the inclusion of India by the United States among the top tier of countries entitled to license-free exports, re-exports, and transfers under License Exception Strategic Trade Authorization (STA-1) and also committed to explore other means to support further expansion in two-way trade in defense items and defense manufacturing supply chain linkages. They welcomed the signing of a Communications Compatibility and Security Agreement (COMCASA) that will facilitate access to advanced defense systems and enable India to optimally utilize its existing U.S.-origin platforms. The Ministers also announced their readiness to begin negotiations on an Industrial Security Annex (ISA) that would support closer defense industry cooperation and collaboration. Recognizing their rapidly growing military-to-military ties, the two sides committed to the creation of a new, tri-services exercise and to further increase personnel exchanges between the two militaries and defense organizations. The Ministers reviewed the recent growth of bilateral engagements in support of maritime security and maritime domain awareness, and committed to expand cooperation. Toward that end, the Ministers committed to start exchanges between the U.S. Naval Forces Central Command (NAVCENT) and the Indian Navy, underscoring the importance of deepening their maritime cooperation in the western Indian Ocean” (India, Ministry of External Affairs 2018). The Ministers reviewed cooperation in the Indo-Pacific region, noting that the common principles for the region articulated in the India-U.S. Joint Statement of June 2017 have been further amplified by President Donald Trump at Danang, Vietnam on November 10, 2017, and Prime Minister Narendra Modi in Singapore at the Shangri-La Dialogue on June 1, 2018. Both sides committed to work together and in concert with other partners toward advancing a free, open, and inclusive Indo-Pacific region, based on recognition of ASEAN centrality and on respect for sovereignty, territorial integrity, rule of law, good governance, free and fair trade, and freedom of navigation and overflight. Noting the importance of infrastructure and connectivity for the Indo-Pacific region, both sides emphasized the need to work collectively with other partner countries to support transparent, responsible, and sustainable debt financing practices in infrastructure development (Ibid). The Ministers recognized the importance and the potential for increasing bilateral trade, investment, innovation, and job creation in both countries. Both sides committed to further expanding and balancing the trade and economic partnership consistent with their leaders’ 2017 joint statement, including by facilitating trade, improving market access, and addressing issues of interest to both sides. In this regard, both sides welcomed the ongoing exchanges between the Ministry of Commerce of India and the Office of the United States Trade Representative and hoped for mutually acceptable outcomes. Both sides looked forward to full implementation of the civil nuclear energy partnership and collaboration between Nuclear Power Corporation of India Limited (NPCIL) and Westinghouse Electric Company for the establishment of six nuclear power plants in India (Ibid). It is very evident that India is likely to open the door for a flood of American goods, particularly the strategic weapons and ‘high technologies,’ given the nature of commitment that India has made. India was already elevated to the status of “Tier-1’ of the ‘Strategic Trade Authorization’ (STA) regime. Washington even announced “immediate funding to seed new strategic initiatives in the Indo-Pacific region.” The Department of Commerce, by granting Strategic Trade Authorization Tier 1 status to India, enabled American companies to export more high-technology items under a streamlined license exception” (US, White House 2018). Secretary of Commerce Wilbur Ross had announced that “India’s status as a Major Defense Partner will allow it to receive more U.S. high technology and military items without individual export licenses. STA Tier-1 treatment, comparable to NATO allies, will expand the scope of exports subject to the Export Administration Regulations (EAR) that can be made to India without individual licenses.” This regulatory change was expected to “enhance the bilateral defense trade relationship and result in a greater volume of U.S. exports to India. Over the last seven years, approximately $9.7 billion worth of licensed exports to India may now eligible for export under this license exception” (Ibid). Thus, with the 2+2 Dialogue, India has literally emerged a major strategic ally of the US, similar to the status enjoyed by NATO allies. This enhanced status will benefit U.S. manufacturers enormously, while continuing to fulfill the ‘strategic responsibilities’ of Washington in the Indo-Pacific region (Seethi 2018). The countries already explored as many as 50 bilateral dialogue mechanisms. It had its significant steps initiated in Washington DC in September 2015 and New Delhi in August 2016. The defence-strategic partnership became a major pillar of bilateral relations with the signing of ‘New Framework for India-U.S. Defense Relations’ in 2005. This was also renewed for another decade in June 2015. India also took part in Rim of the Pacific (RIMPAC) exercise in July-August 2016. Bilateral dialogue mechanisms in the field of defence included a variety of group meetings. The agreements signed all these years included Logistics Exchange Memorandum of Association (LEMOA) signed in August 2016, Fuel Exchange Agreement signed in November 2015,Technical Agreement (TA) on information sharing on White (merchant) Shipping signed in May 2016 and the Information Exchange Annexe (IEA) on Aircraft Carrier Technologies signed in June 2016 (India, Ministry of External Affairs 2017). Last year, the aggregate worth of defence acquisition from U.S. Defence had crossed over US$ 13 billion. Plausibly, the ongoing India-US strategic partnership is in tune with the Trump administration’s National Security Strategy of the United States, December 2017. Obviously, the ultimate objective of the US is to pull India away from all engagements with Russia and China (US, White House 2017b). In April 2018, the US said that it was its policy to ensure that India does become a more influential player in the Indo-Pacific region (US, Department of State 2018c). The pay-off at the 2+2 Dialogue—that India’s partnership in the Indo-Pacific region is a matter of importance for Washington’s game plans against China and Russia—makes India’s rhetoric on ‘strategic autonomy’ a sanctimonious hypocrisy. More importantly, the indication that the civil nuclear energy collaboration between NPCIL and Westinghouse will take a major jump—with the establishment of six nuclear power plants in India—does not augur well. This will certainly trigger anti-nuclear/peace movements in the country.